Jandy and I were awake by 4 AM as we, as well as the rest of the group, were slated to leave, on a hired jeepney, for the Kiltepan (named after the 3 bounding barangays of Kilong, Tetep-An, and Antadao) Viewing Tower vantage point, where we were to view Sagada’s famed sun rise. It was very chilly that early morning, so we all donned our jackets and bonnets and made sure we all brought our cameras (in Jandy’s case, his Samsung Galaxy Tablet). Breakfast would have to wait until our return. The jeepney ride took all of 25 mins., traversing the road leading to Dantay Junction, then turning left towards a winding concrete road then, finally, to Kiltepan Junction, a bumpy shortcut foot trail leading up to the hill on the right. It was still dark when we arrived there and the full moon could still be seen in the night sky. There were already a number on sunrise watchers when we arrived, some bringing along coffee to keep warm together with their cameras and tripods. Soon, more people arrived and the parking lot was soon filled with vehicles, both private and hired. Some enterprising Sagadans, taking advantage of the holiday atmosphere, were making a killing selling freshly-baked pastries. 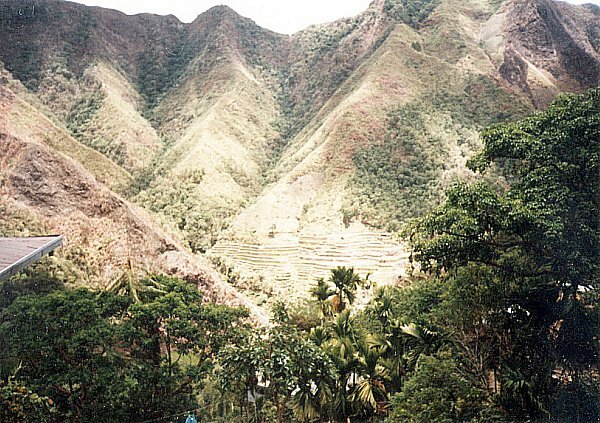 Soon night passed into day and we had an unusual and magnificent bird’s eye view of layers upon layers of the terraces at Kilong and Tetep-an, right down to the river valley and the Cordillera Mountain range, with the clouds below us. Above them are the high ridges separating Bontoc from Sagada. We can also see the remnants of a Piltel antenna tower at the 1,636-m. high summit that was struck by lightning. Then, at the 5:50 AM mark, the sun made its glorious appearance, to the joy of the crowd who had been forewarned that early morning fog can sometimes ruin views of the sun rising. We were lucky to see the sun rise in all its majesty. After breakfast at the Albergo Hotel in Baguio City, Jandy and I packed just enough clothes for our 2-night stay in Sagada (Mountain Province) and left the rest at the Front Office. From the hotel, we took a taxi to G.L. Liner terminal at the Dangwa Compound along Magsaysay Ave., fronting the Baguio Market. We just missed the previous Sagada-bound bus by minutes so we paid the fare for the next bus, scheduled at 10:30 AM. We spent the next hour at the Baguio Cathedral, climbing the steep stairs along Session Rd. to get there. Here, we had snacks at the coffee shop within the compound before returning to the terminal. A few after our return to the terminal, our designated bus arrived and we boarded the bus, sitting up front, to the right of the driver. Soon, sacks, farm produce as well as luggage and bags were also being loaded around our area, making alighting a problem later for us. We left the terminal just before 11 AM but, just before the interchange leading to La Trinidad Rd., traffic slowed us down due to road rehabilitation. After 30 mins., we left the hustle and bustle of Baguio City and La Trinidad and were now on our way on our long-haul, 6.5-hr. drive to Sagada via the Halsema Highway, the highest highway system in the country. Formerly called the “Mountain Trail,” this spectacular 146-km. (95 kms. of which are in Benguet) highway traverses Benguet from south to north. Named after Eusebius Julius Halsema (American civil engineer and mayor of Baguio City, 1920 to 1936), it links La Trinidad and Baguio City with Bontoc, Sagada (151 kms.) and Banaue (196 kms. ), cutting through mountain peaks, gorges and steep cliffs. 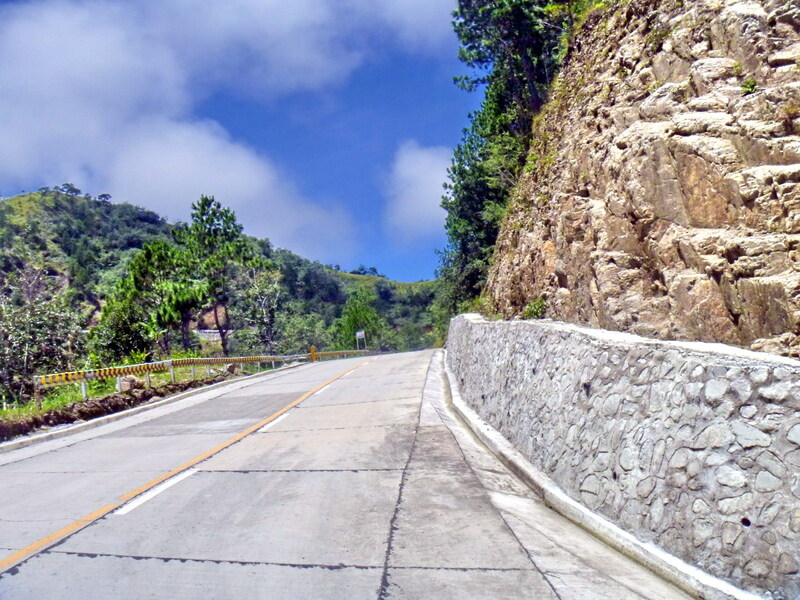 This highway was originally a foot trail used by mountain folk between Bontoc and the foot of Mt. Data. U.S. Army engineers improved and widened it. They also built a new winding road through precipitous slopes and traversing high ridges between Acops and Abatan, The road reached Natubleng in 1928 and more than half its length (to Bontoc) was completed in 1931. All told, the highway took more than 15 years to build and was finally completed in 1936. 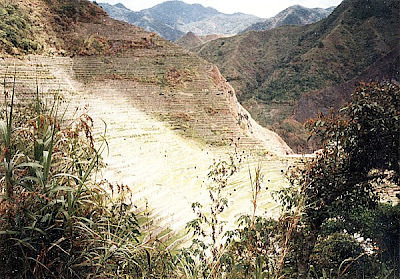 Tracing a circuitous path, this road crosses the massive Cordillera Central mountain range, crossing deep ravines and skirting dangerous slopes. Jandy and I have passed this way before (in 1998), more than half the road then being unpaved, bumpy, rough and dusty. 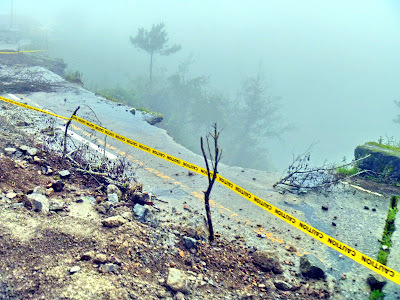 Today, about 95% of the highway is”paved.” Still, landslides are a constant hazard here and big stones and debris tumble from peaks, especially during the rainy and typhoon season. Occasional fog can also ruin a driver’s visibility. However, then and now, we stilled passed through some of the most spectacular mountain vistas found anywhere – magnificent, stonewalled rice and vegetable terraces; swift-flowing rivers spanned by hanging bridges; roadside waterfalls; pine-clad mountains; picturesque villages; etc.. Along Km. 40, approaching Mt. 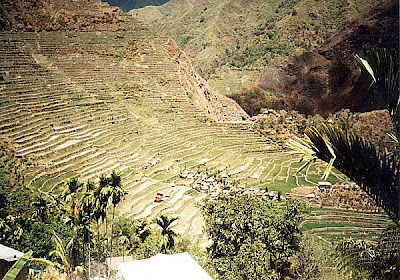 Toyangan, we had good views of the 33-hectare Naguey Rice Terraces, along the banks of the Naburgo River (which joins the Amburayan River below Kibungan) in Brgy. Naguey in Atok. These stonewalled terraces are planted with both rice and vegetables. The Amburayan River runs for about 30 kms. from Brgys. Pasdong to Naguey. 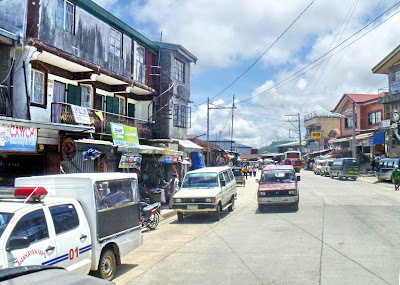 Near Atok’s municipal hall, our bus made a highway stopover for a late lunch at Morning Star Restaurant and Fastfood. About 3 hrs. 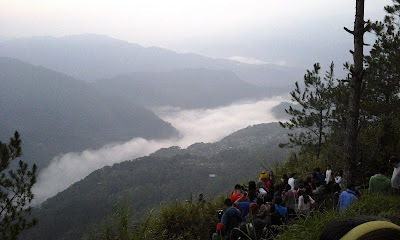 past Baguio City, we passed (but did not stop at) the Highest Point Marker (Philippine Pali), along Km. 53 (Km. 303), Brgy. Cattubo near Bayangan in Atok. Here, the road crosses 2,450-m. high Mt. Paoay. 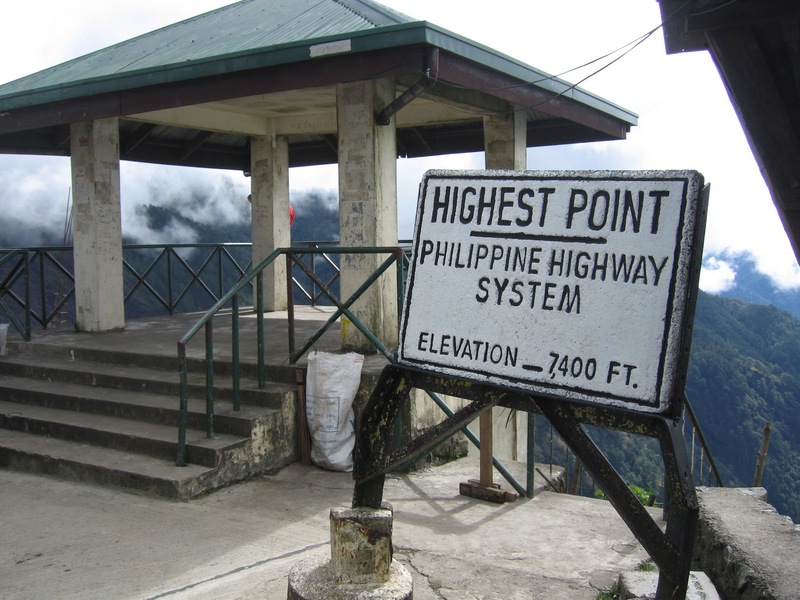 The highest point of all Philippine highways (7,400 ft. or 2,225 m. above sea level), its viewpoint has good views of Mt. 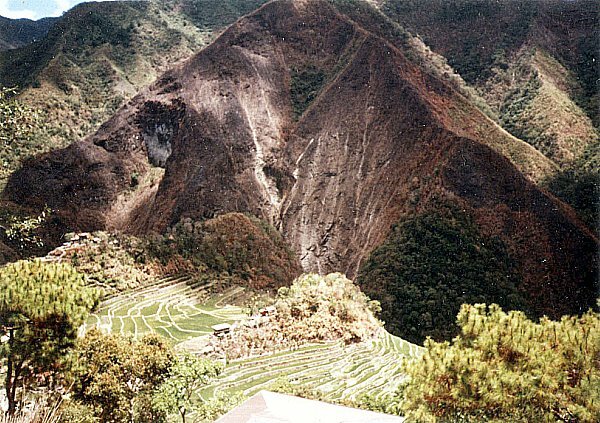 Pulag, Mt. Timbac, Kabayan, Atok and the deep Agno Valley to the south (cloudy during the rainy season). Along Km. 63 are the vast Natubleng Vegetable Terraces of Brgy. Natubleng in Buguias. 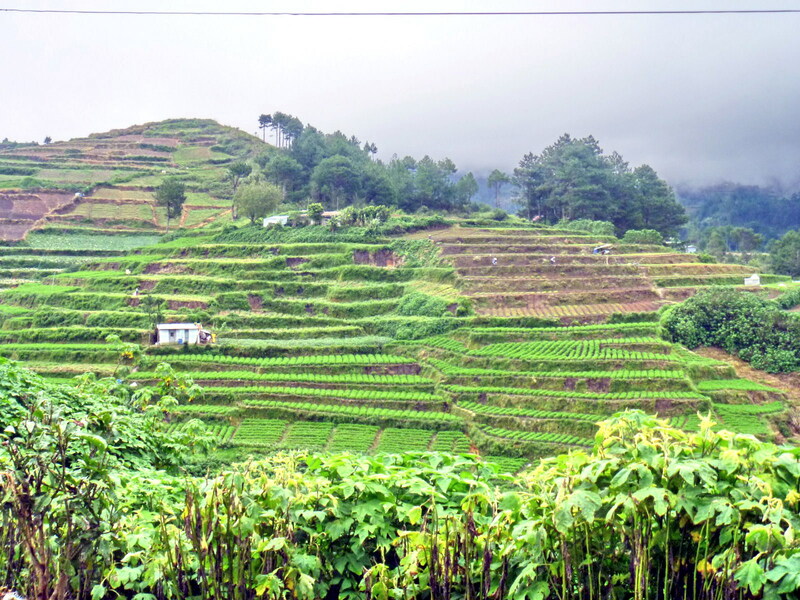 Here, neat rows and upright trellises are planted with temperate-zone climate greens such as Baguio beans, cabbage, carrots and other vegetables and root crops. We also passed the urbanized townships of Sayangan (Atok) at Km. 54 and Abatan (Buguias) at Km. 90. After the copper mining town of Mankayan, we entered Mountain Province at the town of Bauko, site of the 2,310 m. high Mt. 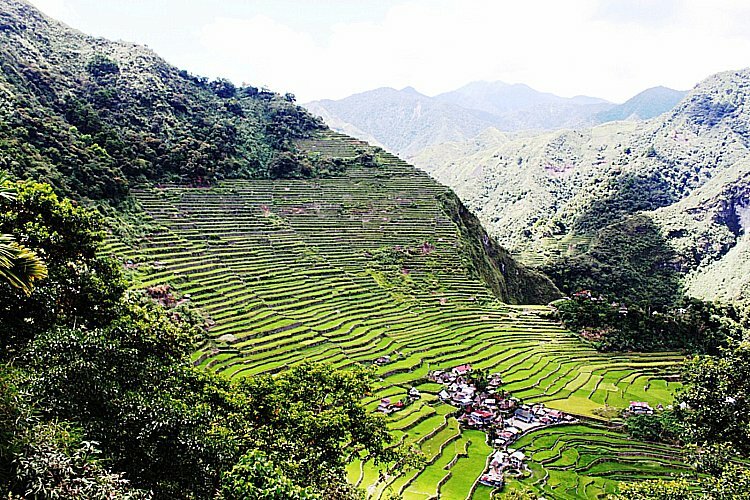 Data and the Philippine Tourism Authority-managed Mt. Data Hotel, then on to Sabangan, the town before Sagada. 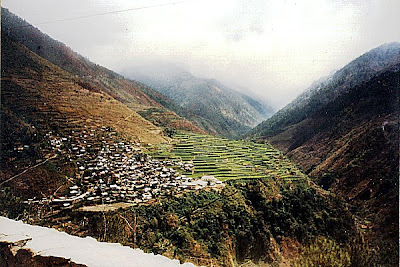 We exited the Halsema Highway when we turned left at the Dantay Junction where the still partly unpaved,10 km. road to Sagada starts. The sun shone brightly when we finally arrived at Adams’ town gym. Here, Dr. Bielmaju Waley-Bawingan, wife of town Mayor Eric T. Bawingan, and a merienda of fresh buko juice and kakanin welcomed us. Once carbo loaded, Dr. Bawingan briefed us on our next activity – a hike to Anuplig Falls, the most impressive of the town’s 11 waterfalls. She furnished us with 5 guides and, laden with bottled water, we now proceeded on our 2.5-km. hike, normally a 45-min. “walk in the park” for the townspeople, but double that for me and my group (and even longer for the others). Though long, the hike was pleasant, the trail moderately graded (except at the steep shortcut we took up a hill), sometimes wide but often narrow. 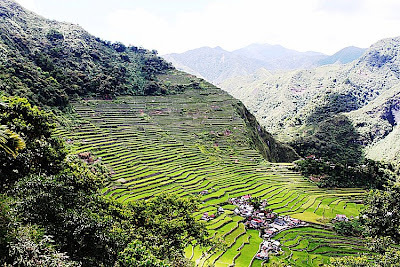 Again, we had fantastic views of forest-cladded mountains, hills and valleys; small, verdant, moderately-sloping rice terraces similar to those found in the Cordillera Region; crystal-clear brooks and rivers (one we crossed via a hanging bridge) and a small waterfall. 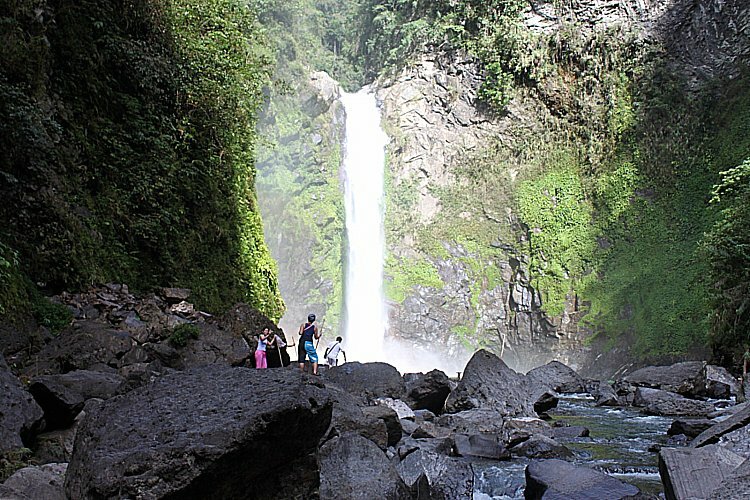 The swirling sound of the Bolo River heralded our arrival at the 25-ft. high Anuplig Falls, its two basins inviting us to swim its bracingly cold water. Some of us (including me) bravely did so, with Frank Dizon at the lower basin: me (spraining my right foot in doing so), Ivan Man Dy and Ian Garcia climbing up to the second basin, and Gabby Malvar, Ida Noelle and Karlo de Leon moving further up to the base and back of the falls itself. Ian, sprained wrist and all, bravely jumped from the top of the cliff safely down to the pool below (not recommended however). 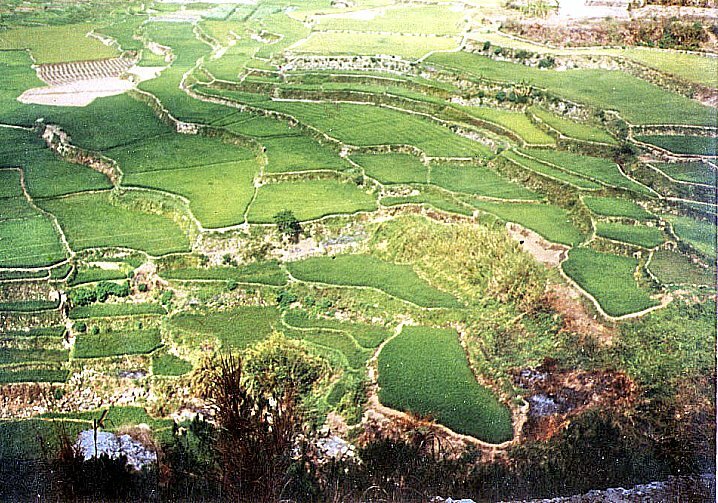 The others just dip their tired feet, took photographs or interviewed Juan Agudo, a septuagenarian local farmer. 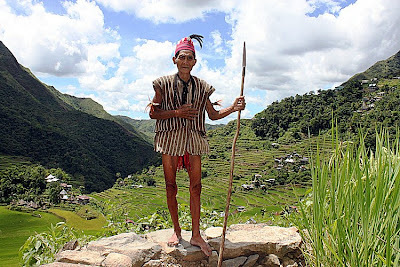 After an hour, we all retraced our way back to the town with yours truly, accompanied by Dandi Galvez and a guide, hobbling along on a sprained foot. The 47-km. 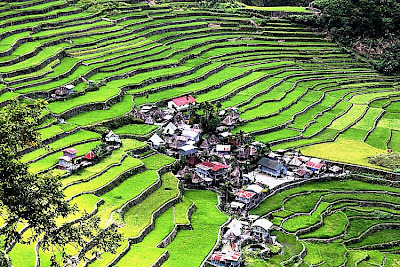 jeepney ride from Bontoc to Banaue, Ifugao province’s main tourism destination, was to take all of 2.5 hrs., the seemingly short distance made while climbing steep mountains via the dusty, narrow and bumpy Halsema Highway. 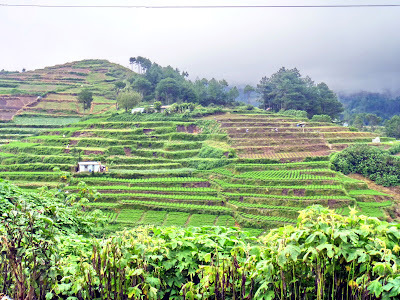 The discomfort was somehow alleviated by great views of some rice terraces that we passed. By 4 PM, we arrived at the parking area for buses and jeepneys at the town’s Trade Center. 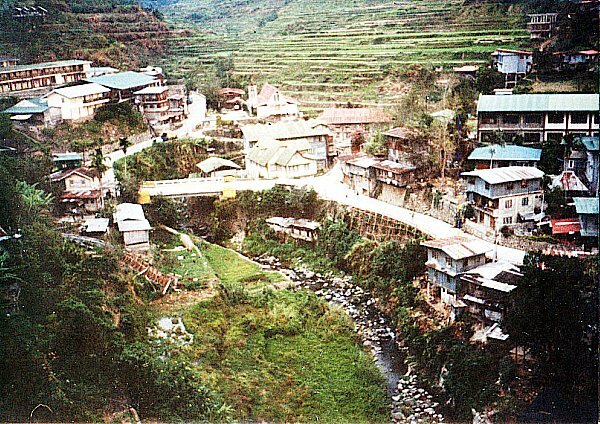 Banaue is the province’s transportation hub, being traversed by the one major highway leading south to Nueva Vizcaya and Manila and by a less-developed road going to Bontoc (Mountain Province), and from there, to Baguio City (Benguet). This touristy area is the center of activity in the town and it has handicraft shops selling different kinds of traditional fabric like the woven bark cloth and dyed ikat cloth, wooden objets d’art such as bowls, trays, oversized spoons and forks, antiques, entirely alien statues of American Indian chiefs and smiling, pot-bellied Chinese gods, and the traditional bul-ols (statues of rice gods). Curio souvenirs include handwoven wall hangings, crocheted bedroom slippers and pfu-ong (traditional jewelry) representing good luck in hunting or prosperity of children. At one end of it is the Municipal Hall and Post Office Sub-station. The next day, Wednesday, we decided to go spelunking at Sumaging Cave. Holy Week was around the corner and we wanted to go there before the onrush of tourists made it a first come-first served affair. Armed with my trusty video camera and point and shoot camera, we proceeded to the municipal hall where the Sagada Environmental Guides Association (SEGA) offers detailed information and guides with ropes and Petromax lamps. They also keep the caves safe for and from tourists. We hired a Kankanai lady guide for PhP300. It is always advisable to go spelunking with an accredited guide. For one thing, they know the way to, from and around the caves and secondly, if accidents happen inside a cave they now where to go for help. Sagada sits on a limestone valley riddled with a total of 20 caves, some short, some interconnected in huge underground mazes. Eleven are burial caves, 6 of which are accessible by foot from the highway. The burial caves have hollow-log “hanging coffins” or kuongs and should be treated with respect. With our guide in tow, we made a 40-min. downhill hike, along Soyu Rd., to the cave. 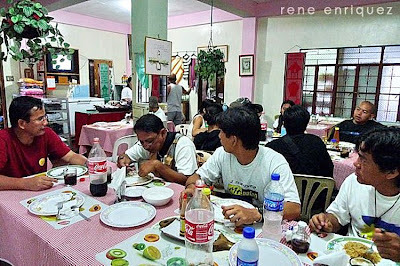 Along the way, we passed many of Sagada’s coffee shops (try Shamrock Café beside the municipal hall) and guesthouses: Country Inn (up the stairs opposite the municipal hall), Masferre’s Inn and Café (displays old Masferre prints), Olahbinan Resthouse & Restaurant and the Greenhouse. Next is the town’s first hotel, the 16-room Sagada Prime Hotel, opened in March 1997. Here, we found a large, unsightly and quite out of place satellite dish. Further out along Soyu Road, on the right, is Demang Village. This old village still holds traditional rituals at dap-ays (used by men of the village for meetings and ceremonies). On the left, we saw some hanging coffins on a rock face. 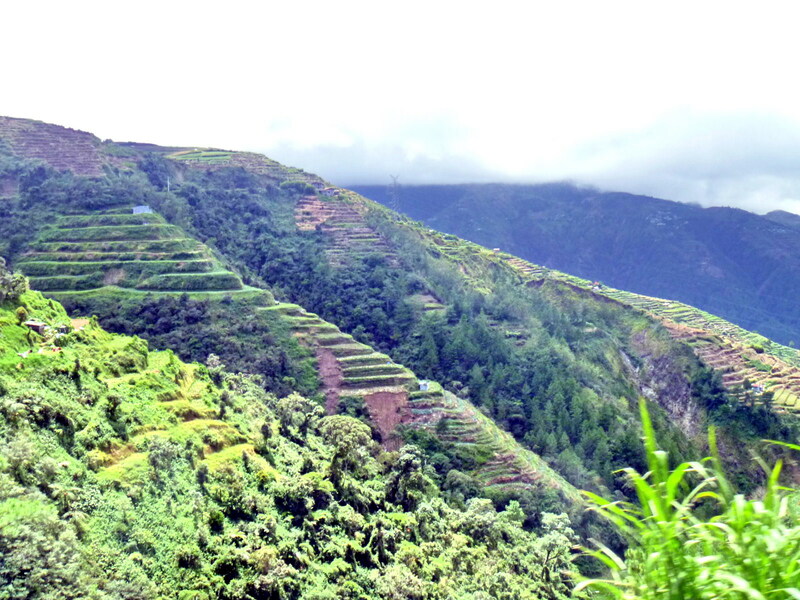 Also along the way we passed some beautiful rice terraces. Further down, to the left, we entered a path leading to Sumaging Cave’s (also called Big Cave, Marcos or Latipan Cave) big yawning entrance. Entering the cave doesn’t require special training or equipment but the first 100 m. entailed a steep and slippery descent. At a certain point, we were required to take off our shoes. Our guide pointed out the cave’s many unusual and grotesque limestone formations including “Pig Pen,” “Rice Granary,” “Giant’s Foot,” “Dap-ay,” “Pregnant Woman” and the impressive “Dancing Hall” and “King’s Curtain.” We didn’t go beyond “King’s Curtain” as Jandy had difficulty going down. The guide said that beyond was a cold, knee-deep underground stream which accumulates into a large, 15-ft. diameter and 6-ft. deep vaulted pool 250 ft. down. Its waters swirl through a funnel at the side of the mountain. After about 2 hrs., we made our way back and out of the cave. The tourist route takes about 3 hrs. but a full exploration of the cave entails at least 6 hrs. and some areas at its deepest levels can only be traversed by serious spelunkers with cave climbing equipment. The cave also has other exits but most are difficult to reach by land. On our uphill trek back along Soyu Road, past the junction, is a path on the right with a fence. Here, steps going down the path leads to Lumiang Cave. We stopped just at the large cave entrance where many old and a few newer coffins were stacked. A portion of the cave’s mouth had collapsed and broken bones and coffin fragments litter the floor. We felt no need to go inside. The guide told us that this cave is connected to Sumaging Cave but reaching it would entail 6 hrs. 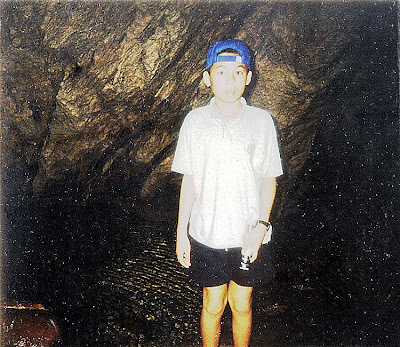 of spelunking. There are other caves that could be explored farther out but we were just too tired to explore them. We returned to our inn for lunch and a much needed bath. I opted for a noontime bath thinking the water would be warmer. Boy was I wrong! Brrrr…..!